Over the last few months, my fellow bloggers have risen admirably to the Cheese, Please! Recipe Challenge with a variety of cheeses: cow, sheep and goat; soft and hard; and last month’s smoked cheese extravaganza. I’d had a certain cheese in mind for December for a while; both seasonal and distinctive, Stilton seemed the perfect choice. But then I started to feel a bit bad as one of the stalwarts of Cheese, Please!, who will remain nameless Food Day-Dreaming, is afeared of the blue cheese. Now obviously what I should do is either force-feed her Roquefort until she comes to her senses or else tell her to never darken my blogging doors again with her deranged tastes. But, hey, it’s nearly Christmas and I’m no cheese scrooge so I am delighted to announce that December is a Cheese, Please! free-for-all. Any cheese, from any animal, from any country, soft or hard, young or old, is permitted, just so long as it’s used to make some sort of Yuletide snack. All the best soirées need a cheesy nibble so from gougères to goujons, pasties to pastries, tarts to toasts, balls to bites and crisps to crudités, let your cheese imaginations run wild. If you can balance it on a paper plate, whilst simultaneously holding a glass of mulled wine and trying to angle yourself so Peter from Technical Services can’t look down your cleavage, then you can enter it in December’s Cheese, Please! Challenge. Extra points this month for festive decorations and/or the inclusion of cocktail sticks or tinfoil hedgehogs*. And reindeer costumes. And Stilton, obviously. * For those unfamiliar with the tinfoil hedgehog, the traditional British way of serving cheese, look here. Want to take part in December’s Cheese, Please! Recipe Blog Challenge? Check out the full rules here. 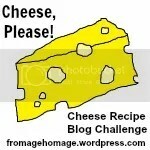 Write a recipe post using the featured cheese/theme of the month and post it on your blog. My Linkytools account is currently ‘experiencing technical difficulties’ but if you tweet the link to me @fromhomage or email it to fromagehomage@yahoo.co.uk then I will pick it up and post a link on this page. Seasons Greetings to everyone; may your festive cheeseboard be stinky and groaning. I have a few cheesy appetisers I was planning to make. Well get working on some festive decorations!! And the reindeer costume? 😉 Look forward to seeing what you come up with. Off to look out some nice orange supermarket cheddar and a tin of pineapple… I have something in mind! Pork Belly’s on the case…but how to entice the reindeer to pose for the photo……? Pingback: Pecan and Cranberry Cheese Log & Cookbook Giveaway! | the taste space - steam, bake, boil, shake! Pingback: Warm Spinach and Artichoke Dip | the taste space - steam, bake, boil, shake!